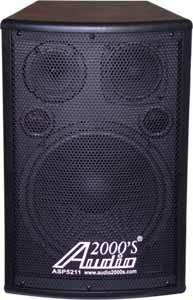 speakers are very important to the overall sound of a karaoke system - check out the full line of speakers we carry at 800-karaoke.com, the internet's best karaoke source! portability: relatively light weight (21.5 lbs) for its sound level driving capability (power: 400w, max; 200w, rms; freq. response: 40-20,000hz; sensitivity: 96db @ 1w 1m). mountability: a built-in internal speaker mounting top hat makes it possible that a light-weight karaoke speaker can just be placed on the top of a speaker stand without using an external mounting device. also, top-mount jacks and screws are provided for mounting the asp5211 to the wall or ceiling. connectability: a pair of banana jacks are utilized for connecting the speaker cables. sound quality: a high efficiency 10" woofer, a 3 1/2" tweeter, a 2 1/2"; tweeter and a built-in crossover circuitry are provided for smoothly transforming the electrical acoustic signal to full and transparent sound waves. versatility: the physical configurations allow the asp5211 to be utilized as a main loudspeaker or to be placed on the performance floor as a sound monitor speaker.